Solid cage for rodents for indoor use. The bars are made of metal and the cage bottom of solid plast.. The Dry – Clean Shampoo deodorizes and mildly cleans the coat without bathing. It neutralizes bad od.. Ear Care drop Ideal for cleaning and care of the auditory canals. Mildly cleans ears, enhances proc.. This product is used for care and cleaning of the eyes. This is mild cleaner which frees the adjacen.. Tear Stain Remover Gentle cleaning for dogs, cats, rabbits and other small animals. 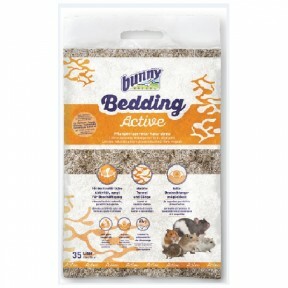 Tear stain remo..
Bunny Bedding Active combines many amazing features of different products in one: it is very absorbe.. Product Description: Bunny Bedding Cosy is the super-soft natural straw bedding for rabbits and ro.. Product Description: Bunny Bedding Linum is a natural linen bedding. It offers your pets maximum c.. Product Description: care natural is completely natural and made from pine heartwood extract. The .. Product Description: The Crunchy Cracker with a mildly earthy and spicy flavor. A combination our .. Product Description: Distinctive in taste and incredibly popular: the carrot. Now in combination w.. Complete food for Dwarf Hamsters Ingredients Plata millet, canary seed, pea flakes, quinoa seeds.. Product Description: Complete food for Guinea Pigs from the age of 5 months Ingredients Growth.. Product Description: Complete food for Guinea Pigs until the age of 5 months Ingredients: Gr..